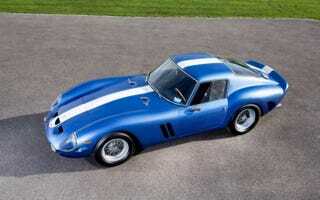 According to the Telegraph, a 1962 Ferrari GTO will be the first of its kind auctioned publicly in over 20 years. Only 36 examples were produced and the car in question was the second to roll off the assembly line. “I’ve been looking for a 250 GTO for a while and the opportunity came up with this one, which is the second GTO built. Yes, absolutely filthy rich people seem quite concerned with the trajectory of the economic markets ever since Donald Trump was elected. They truly are an overlooked demographic. That is why this is GTO is the perfect investment for filthy rich people worried about becoming slightly less filthy rich. Regardless of your political leanings, to suggest that investing in a vintage Ferrari is some kind of hedge against a global economic catastrophe is both hilarious and stupid. If you can afford to buy a $56 million vintage Ferrari, you are going to be OK if the markets drop. Furthermore, even if economic armageddon does happen, once the dust settles, who is going to be able to afford your $56 million Ferrari and have the ability to purchase it for more than you bought if for so that your “investment” is justified? If you have the means, you aren’t buying a car like this as part of your long-term investment portfolio, you are buying a car like this as bragging rights and I don’t blame you one bit. If I ran out of creative ways to blow millions of dollars, I’d put a bid in on the legendary Ferrari GTO. I would not, however, be foolish enough to think that this car is going to be the thing that gets me through the next depression—whenever it may come.